Last year at this time we were in the middle of all the excitement of Katherine’s willow baskets at the Cole-Ware Exhibition at the Renwick Gallery in Washington, DC and her teaching at the National Basketry Organization Conference at Arrowmont in Gatlinburg, TN. This year’s events are a little closer to home. Details below about two upcoming shows in our area. We are also happy to announce that Katherine will be back teaching at the Northwest Basket Weavers Guild Retreat in March. October 31, November 1 and 2 at Maple Hall, 104 Commercial Street: Annual arts celebration in nearby La Conner, WA featuring work from 13 invitational artists and over 80 works in the open show where Katherine will have a basket called Pi(e) (image left). There will be an opening on the Friday evening from 5-9pm with live music, wine and food. There will also be artist demonstrations throughout the weekend. 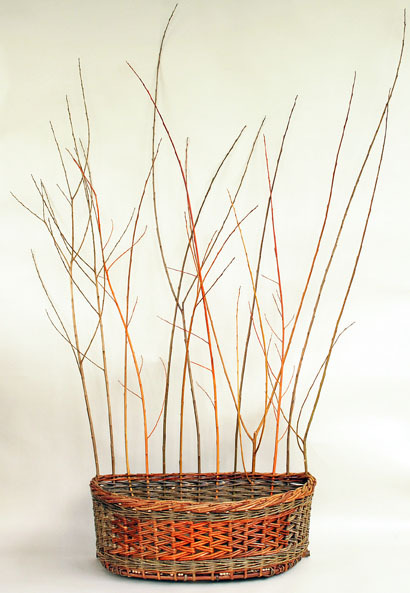 Katherine will be demonstrating her willow basketry from 1-3pm on Sunday. 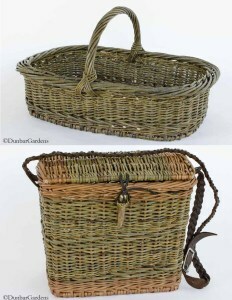 She will have several more willow baskets on display in the demo area. Admission is free. Opening Friday, November 14 6-8pm, Open Sat.-Sun. Nov, 15-16 & Nov. 22-23, 10-5. An arts and crafts show held twice each year in the Skagit Valley at the historic Rexville Grange (19299 Rexville Grange Road). Katherine will have a large selection of her baskets available. There will be paintings, pottery, fiber arts, jewelry, photography and more by an impressive list of local artists. The opening evening on November 14 will feature live Celtic music by Campbell Road as well as refreshments and a chance to mingle with artists and friends. If you want a chance to chat with Katherine other than the opening, she is scheduled to work all day on Saturday Nov. 22. 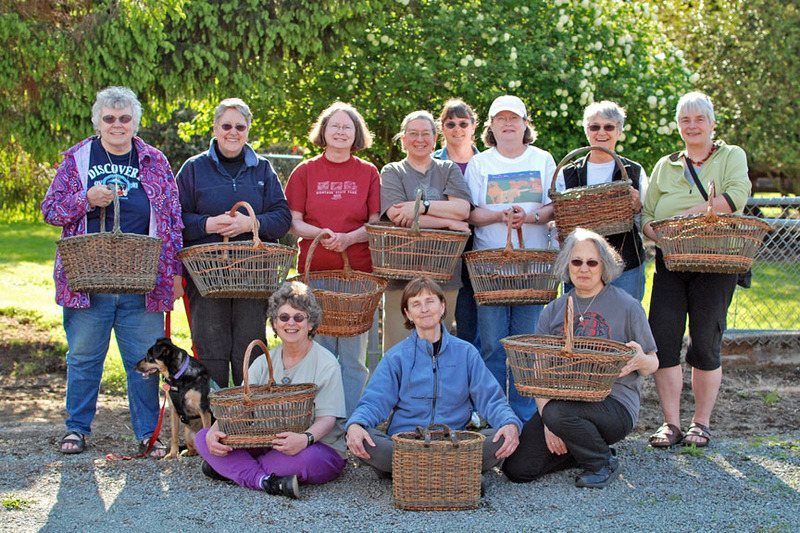 March 11-15, 2015, Pilgrim Firs Conference Center, Kitsap Peninsula: Katherine will be teaching two willow basket classes at this year’s retreat. 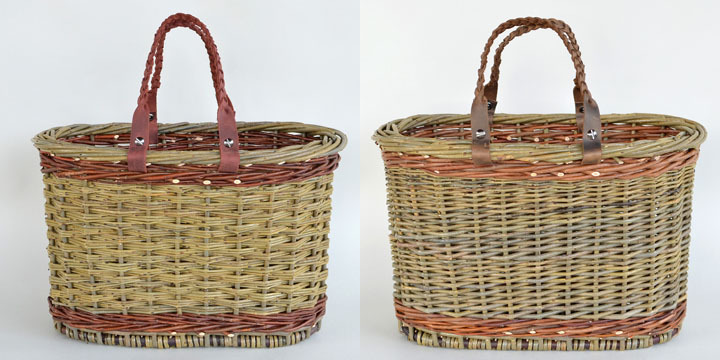 One is a 14 hour class making Katherine’s ‘potluck’ basket and the other is a 19 hour class making her willow ‘purse’. If you have been wanting to take classes from her, this will be a great opportunity. Class size is limited to 10 people and will probably fill so you are advised to check the website soon for the class descriptions and brochure (probably early November). You need to be a member of the Guild, but you can join on your registration form for the retreat. It’s a fun event and organization. Earlier this year Katherine joined the Board of the NBO. She has been a member for several years and was invited to teach at the conference last year. The conference next year will be in Minneapolis/Saint Paul, Minnesota July 14-19, 2015. The Board has been working hard to make it another great event. Katherine has been working on getting the various basketry guilds across the country more involved with the organization. She hopes many of you will consider joining or supporting the NBO. 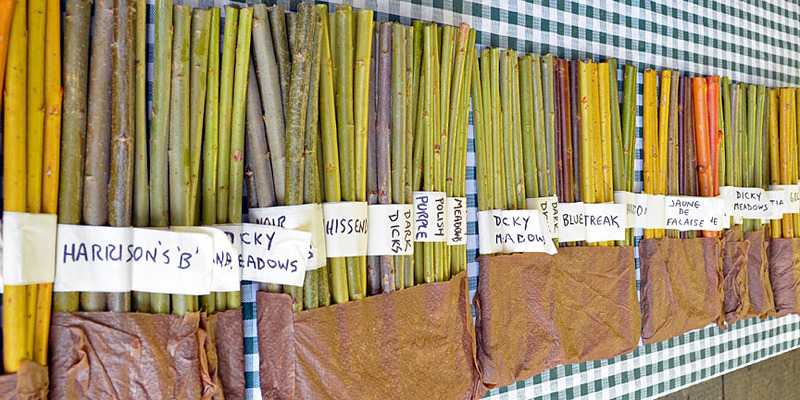 Time to start thinking about willow cuttings. Steve takes orders starting January 1 through March 31. We ship orders through the end of May according to your planting needs. We will be updating the website soon with 2015 availability and prices. If you ordered in previous years, we love to hear feedback on how the varieties are growing in your area. Last year alone we shipped out some 8000 cuttings so we hope there will be a lot of willow baskets getting woven in the near future. A big thanks to everyone who has purchased Katherine’s baskets! Just a reminder to order early if you want something before the end of the year! 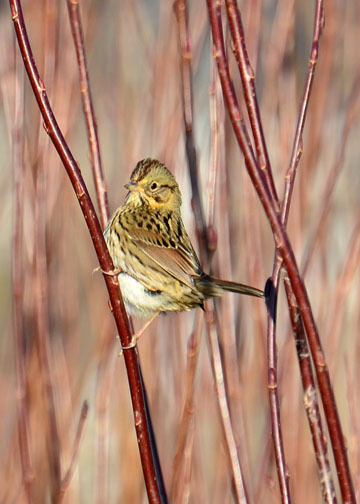 Pinterest: Dunbar Gardens now has a Pinterest page where we have boards featuring Katherine’s baskets, basketry willow, other willow baskets and makers, as well as some bird photos. Katherine was honored to be informed that three of her baskets were recently acquired by the Renwick Gallery at the Smithsonian American Art Museum. 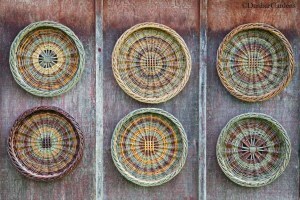 In 2011, Katherine made several baskets for collectors Steven Cole and Martha Ware. 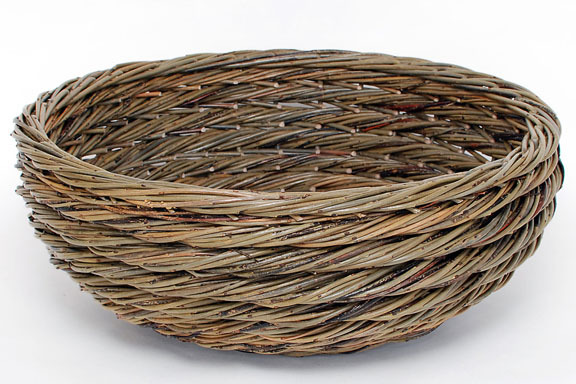 They have a large collection of baskets made by American basketmakers from materials that they collect or grow themselves with an emphasis on functional or traditional design. Their collection includes the work of some impressive artisans including Darryl & Karen Arawjo, JoAnn Kelly Catsos, Jeffrey Gale, Jonathan Kline, Dona Look, Leon Niehues, Alice Ogden, JoAnne Russo, Aaron Yakim & Cynthia Taylor, and Jamin Uticone. 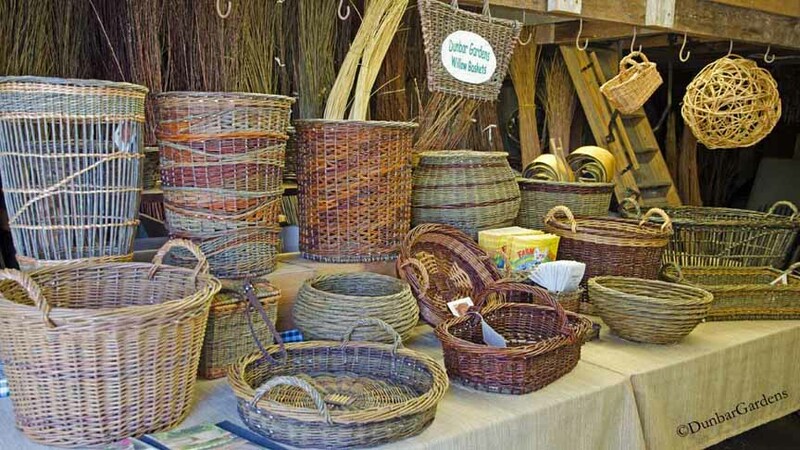 Some of the willow basketmakers represented are Jennifer Heller Zurich, Joanna Schanz, Jo Campbell-Amsler, Bill Roeder, Jean Gage, and Lisa Head. 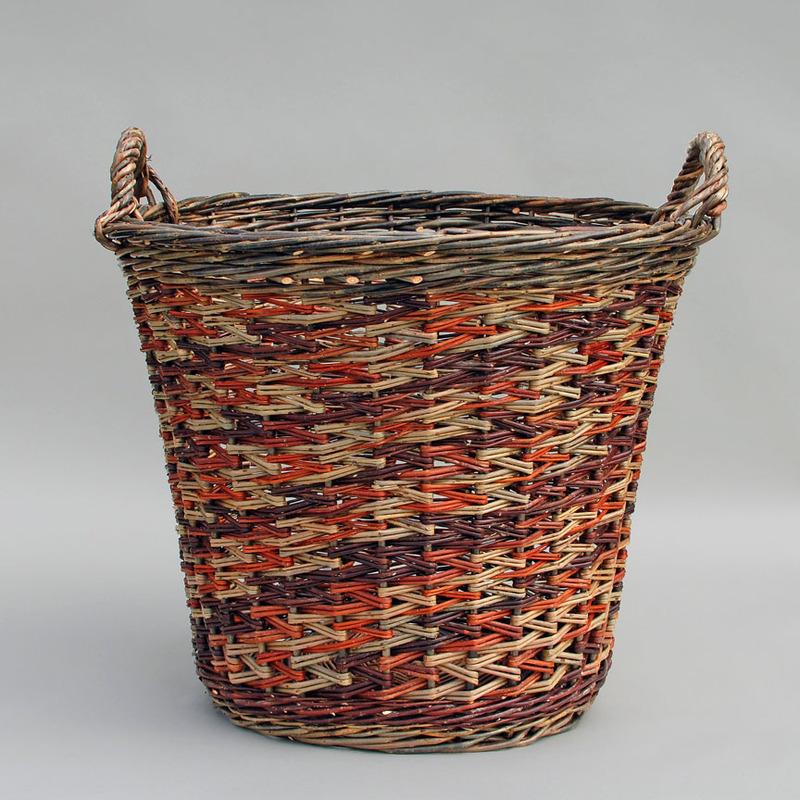 Steve and Martha have recently donated a significant number of their collection to the Smithsonian where they are preparing an exhibit of the baskets at the Renwick Gallery in fall, 2013. 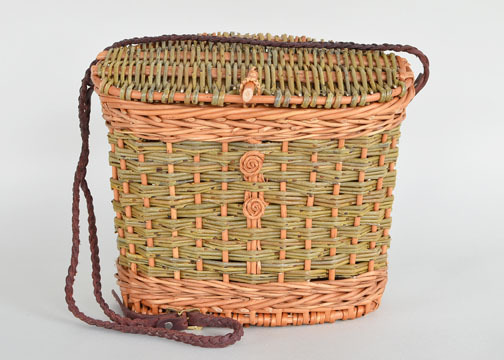 You can see Katherine’s baskets included in the collection on the Smithsonian website here: http://americanart.si.edu/collections/search/artwork/results/?id=30089 You can click on the hyperlink name of each basket to be able to view larger images of the work. 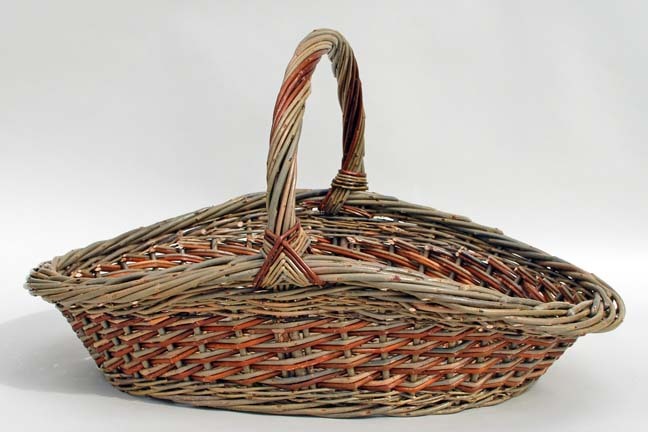 Below is one of the baskets in the collection. We actually prefer this view of the basket to the one posted on the Smithsonian’s site. MoNA Style 2012: Museum of Northwest Art in La Conner, WA, March 17, 2012. This annual show features wearable art and home furnishings from Northwest artisans. Part of each sale helps support the museum. Katherine will be there with willow baskets along with 30 plus vendors of handmade creations. “Willow Knot” Basket exhibit: Philip Dickel Basket Exhibit Museum Gallery in Amana, Iowa, April 2 – September 29, 2012. Katherine made the willow purse below for this annual exhibit organized by Joanna Schanz of the Broom and Basket Shop in West Amana. The willow knot refers to the large willow rod that is wrapped around a willow bundle and ‘cranked’ until it resembles a knot. Katherine added a pair of tiny knots as embellishments to this purse. March 14 -15, 2012: Northwest Basketweavers Guild Spring Retreat: Katherine will be teaching a “Double border tray” at this year’s retreat. See the Guild’s website for full details. June 1-3, 2012: Willow Weekend in Entiat, Washington: This weekend event in eastern Washington organized by Claudia Mullek will feature workshops by Judy Zugish, Jo Campbell-Amsler, and Katherine Lewis. Katherine will be teaching a two day class in which people can weave either a round gathering basket or an oval garden basket. There are still places available in this class. Friday evening will feature presentations by the three artists about their work. You can find details and a registration form here in this pdf on our website. Katherine is expecting to post some dates for classes at Dunbar Gardens for late summer. We’ll be sending another email out in late spring with updates. 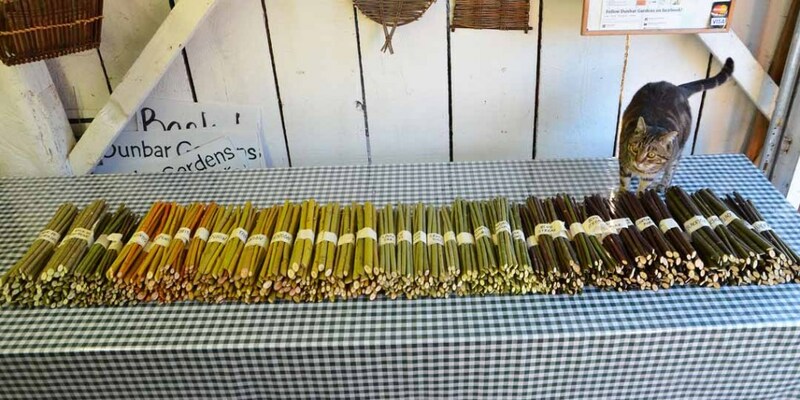 It’s the time of year to order willow cuttings. We have a nice selection of varieties for planting listed on our website. Depending on your location, March through mid May is a good time to plant. There are planting tips on the website. If you need advice or have questions, send Steve an email. Facebook: Dunbar Gardens has a Facebook page. We post photos of Katherine’s latest baskets, commissions, and photos of the farm. You don’t have to be a Facebook user to visit our page and look at the photo albums we have posted there. We hope your new year is off to a good start. 2011 was a busy year for us. As many of you know, Katherine made a six week trip to Europe to visit basketry festivals, basketmakers, museums, and study willow basketry to improve her skills and knowledge of the craft. See below for information about her upcoming presentation in Seattle on the trip. After getting back, Katherine made several new pieces for Art’s Alive (November 4-6) in La Conner where she was invited to participate in the ‘Emerging Artists’ exhibit. Then we were fortunate to get a mention in a Rita Konig column in the Wall Street Journal about log baskets and fireplaces. Next thing Katherine knew she had a waiting list of orders. Although it is nice to be busy, Katherine hopes to spend time this spring concentrating on work inspired by her trip. Baskets in Europe, 2011: Katherine Lewis presentation to the Northwest Basket Weavers’ Guild, January 11, 2012, 6:30PM, Shoreline Unitarian Church, 14724 1st Avenue NE Shoreline, WA. Katherine will be presenting a program about the three basketry festivals she attended in Europe in 2011. She will show photos and discuss the three festivals in Vallabregues, France; Nowy Tomysl, Poland; and Lichtenfels, Germany. Each festival was unique in both basketmakers and staging of the event. 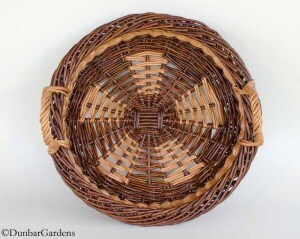 She will also bring baskets that she purchased from some other willow basketmakers. Everyone is welcome to attend. Katherine’s program will begin at 7:30, but baskets and other trip souvenirs will be available for viewing at 6:30. Artist Trust Benefit Art Auction: Fisher Pavilion at Seattle Center, February 25, 2012. Annual event to benefit Artist Trust which supports Washington artists of all disciplines through grants and career training programs. 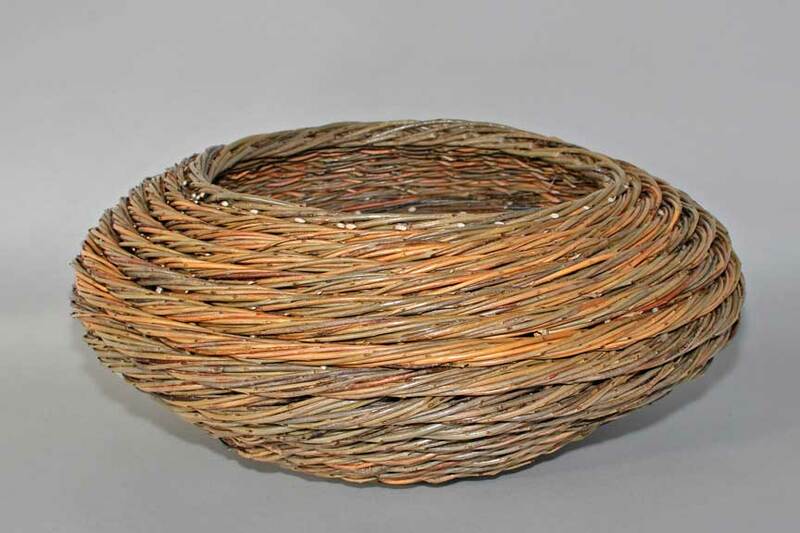 Katherine received a $1500 grant from Artist Trust to help fund her study with basketmaker David Drew in September, 2011. Katherine is donating one of her baskets for the auction. MoNA Style 2012: Museum of Northwest Art, La Conner, WA, March 17, 2012. This annual show features wearable art and home furnishings from Northwest artisans. Part of each sale helps support the museum. Katherine will be there with willow baskets along with 40 other vendors of handmade creations. March 14 -15, 2012: Northwest Basketweavers Guild Spring Retreat: Katherine will be teaching one 10 hour class “Double border tray” at this coming year’s retreat. See the Guild’s website for full details. Unfortunately, the Guild is only offering one class by Katherine this year. Want more willow classes at retreat? Make it known to the retreat committee. 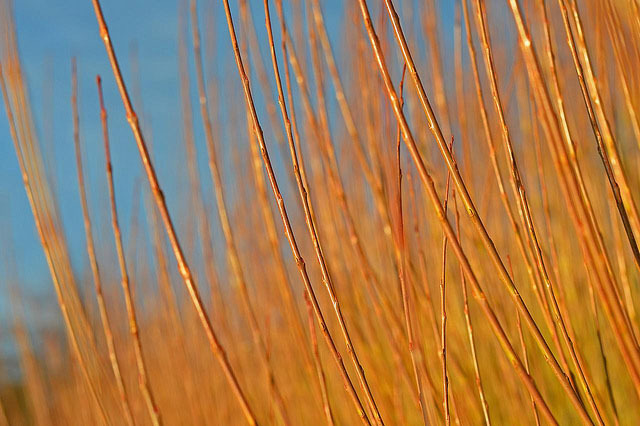 June 1-3, 2012: Willow Weekend in Entiat, Washington: This weekend event in eastern Washington organized by Claudia Mullek will feature workshops by Judy Zugish, Jo Campbell-Amsler, and Katherine Lewis. Katherine will be teaching a two day class in which people can weave either a round gathering basket or an oval garden basket. Friday evening will feature presentations by the three artists about their work. You can find details and a registration form here in this pdf on our website. Willow Gathering 2012 in Decorah, Iowa, June 21-26, 2012: Katherine has been invited to teach in Iowa at this workshop organized by Jo Campbell-Amsler and Lee Zieke Lee. 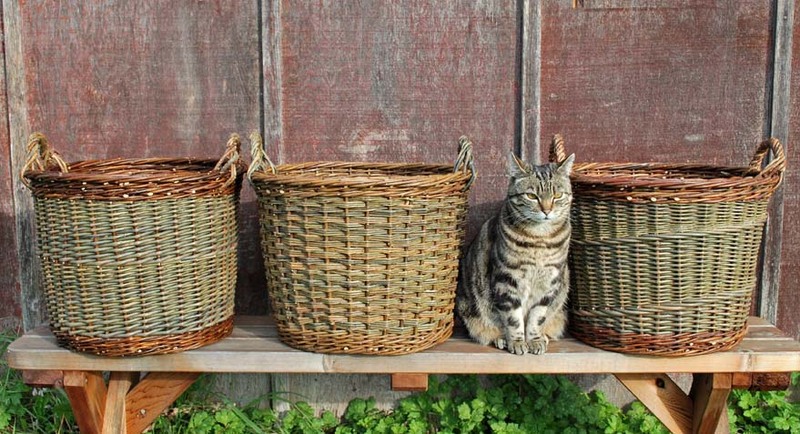 She will be teaching three two-day classes: rope coil, scallomed oval baskets, and Irish potato basket. For those of you who live in the Midwest this will be a great opportunity to take one or more of Katherine’s classes. Also teaching at the event will be Sandy Whalen and Donna Kallner. The organizers expect the classes to fill well in advance. Information and registrations are available through Jo Campbell-Amsler. See the brochure. Katherine is expecting to post some dates for classes at Dunbar Gardens for late summer. We’ll be sending another email out later in the spring with updates. Facebook: Dunbar Gardens has a Facebook page. We post photos of Katherine’s latest baskets, commissions, and photos of the farm as well as other links of interest for willow basketry. 18th Juried Art Show at the Schack Art Center (Arts Council of Snohomish County): Everett, WA, June 30 – August 25, 2011. Katherine has one basket – “Harvesting the Skagit” – entered in this biennial exhibit of Northwest artists represented in a wide variety of mediums. Katherine’s piece received an honorable mention in the juror’s awards. Anacortes Arts Festival – ‘Experience Art’: Anacortes, WA, August 6-7, 2011, 10am – 4pm. Katherine has been invited to be in the ‘Working Artists’ demonstration area. The AAF is one of western Washington’s best arts and crafts festivals. As part of the 50th anniversary of the festival, they will be expanding the number of artists presenting and demonstrating their work in this area at the north end of Commercial Avenue. Come watch and talk with Katherine about her work. All Things Considered VI – National Basketry Organization Juried Exhibit at the Fuller Craft Museum: Brockton, Massachusetts, July 30-December 12, 2011. 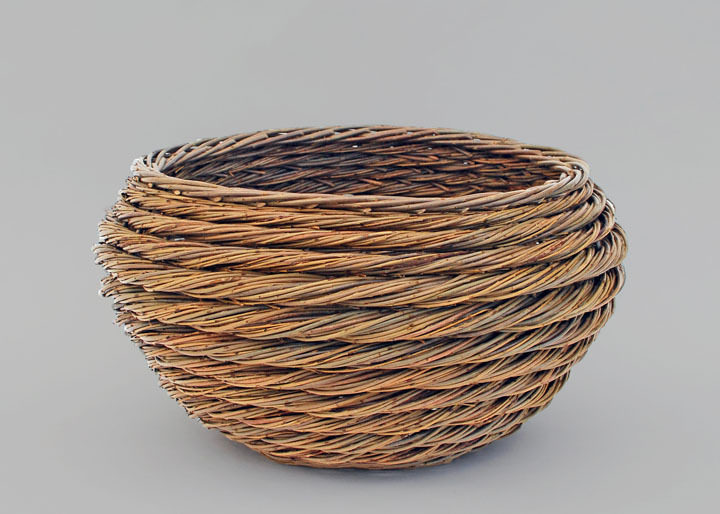 This biennial exhibit highlights the diversity of contemporary and traditional basketry in the US. There will be 48 invitational pieces and 37 pieces juried by Bruce Pepich and Ann McMullen. Katherine is excited to have her piece ‘Nana Queen’ juried into the show. 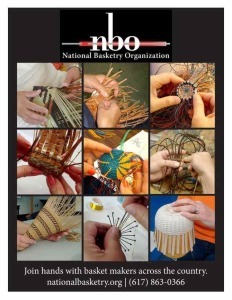 There will a catalog of the exhibit published by the NBO. Festival of Family Farms at Gordon Skagit Farms: October 1-2, 2011. 10am-4pm, 15598 McLean Rd., Mount Vernon (just around the corner from Dunbar Gardens). Katherine will be demonstrating willow basketmaking and selling baskets at the Gordon’s Autumn Harvest Farmstand as part of the annual Skagit Valley farm tour. Art’s Alive! 2011: Maple Hall, La Conner, WA, November 4-6, 2011. Katherine has been invited to participate in the “Emerging Artists” Exhibit this year. She will have several pieces on display for sale. The opening will be Friday, Nov. 4, 6-9pm. There is a wonderful selection of artists in the invitational and emerging artists’ shows. There will be many artists exhibiting and demonstrating around town that weekend. Katherine will be doing a demo at the Skagit Historical Museum. One of the pieces that Katherine has created for the exhibit is ‘thirteen branches’. Swiatovy Festiwal Wikliny – The World Festival of Wicker and Wickerwork: Nowy Tomysl, Poland, August 26-28, 2011. Katherine was invited to attend this biennial event in Poland. There will be basketmakers from about 30 countries participating in the event with competitions, demonstrations, parades and more. This area is a large producer of willow, so it will be of a particular interest to Katherine and her basketry work. Katherine has used the invitation to the festival in Poland as a motivation to organize a trip to Europe to study willow basketry. She will be leaving in August for six weeks to visit France, Switzerland, Czech Republic, Poland, Netherlands, and Germany. 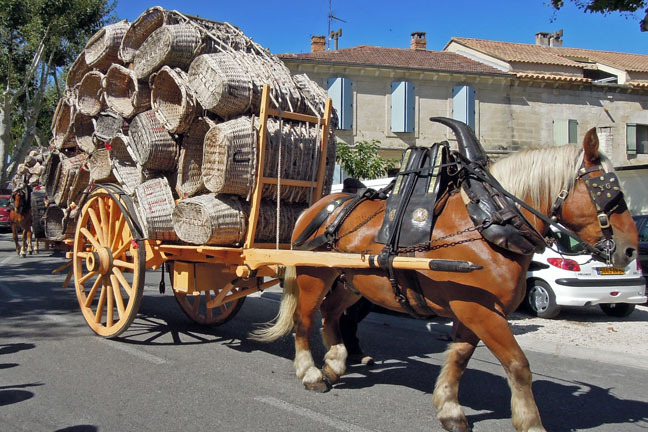 Stops will include three major basketry festivals: the Fête de la Vannerie in Vallabrègues, France, the World Festival of Wicker in Nowy Tomysl, Poland, and the Korbmarkt in Lichtenfels, Germany; as well as visits to several museums and basketmakers’ studios including one of her early mentors Werner Turtschi. Katherine has also arranged to study with David Drew in Villaines-les-Rochers in the Loire Valley of France for several days. She met David when she was in Villaines in 2006 taking a class at the Cooperative de Vannerie. She is excited to go back and get a chance to work with such an outstanding willow basketmaker. Katherine will be posting photos and comments during her trip on the Dunbar Gardens Facebook page. Due to Katherine’s trip to Europe and her busy schedule of basketmaking, the next class here in Mount Vernon will be December 3 & 4. This will be a two day class with a focus on small projects. Several people have expressed interest in weaving small baskets for gifts. More details will be posted on our website later in the year. The class will be the usual two days, 9am-5pm, limit 10 people, $175, at the McLean Road Fire Hall. Willow Gathering 2012 in Decorah, Iowa, June 21-26,2012: Katherine has been invited to teach in Iowa at this workshop organized by Jo Campbell-Amsler and Lee Zieke Lee. She will be teaching three two-day classes: Scottish rope coil, scallomed oval baskets, and Irish potato basket. For those of you who live in the Midwest this will be a great opportunity to take one or more of Katherine’s classes. Also teaching at the event will be Sandy Whalen and Donna Kallner. The organizers expect the classes to fill well in advance. Information and registrations are available through Jo Campbell-Amsler – jocamsler@hotmail.com. Farmstand: Despite the cool weather we have been experiencing, the farmstand is open with a variety of produce fresh from our garden every Friday, Saturday, and Sunday. You can find details on the website. Come out and enjoy the produce this year because Steve is thinking he needs to start making baskets so that he doesn’t miss out on the next trip to Europe! For more information about classes, baskets, willow growing, or our farmstand please visit our website.